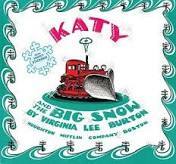 Katy and the Big Snow, by Virginia Lee Burton is a classic children’s book that continues to be beloved today. After three nor’easter snow storms these past two week, it was the perfect read. The book never gets old, children always find something new. Today was no exception. Frankly, the book exploded into unexpected learning about directions, geography, a yard stick, and more. As we enjoyed reading the first page, I had an epiphany. The border depicts all the trucks that belong to the highway department. A border. Wait a minute — the only other author that does that in her books is Jan Brett. Of course; Jan Brett must have read Katy and the Big Snow when she was young and been inspired. I felt like a child in school who “got it”. This was exciting! We stopped to talk about The Mitten, a Jan Brett book we read last Friday. 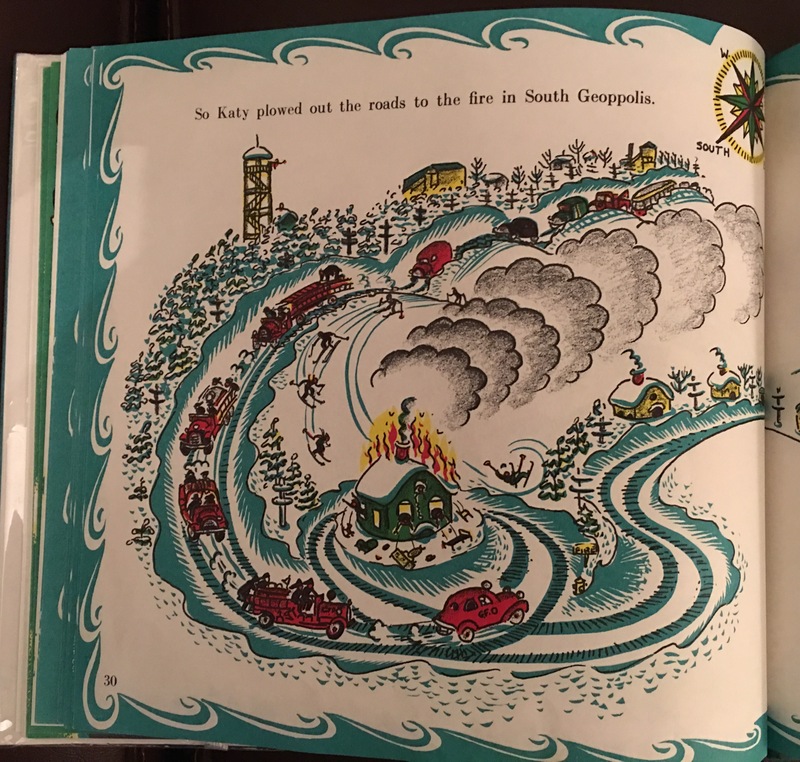 They were different, yet the same; different because Jan Brett’s borders in her books are clues to the next page, the same because the borders in Katy and the Big Snow detail the story. It took a long time to finish reading the first page. 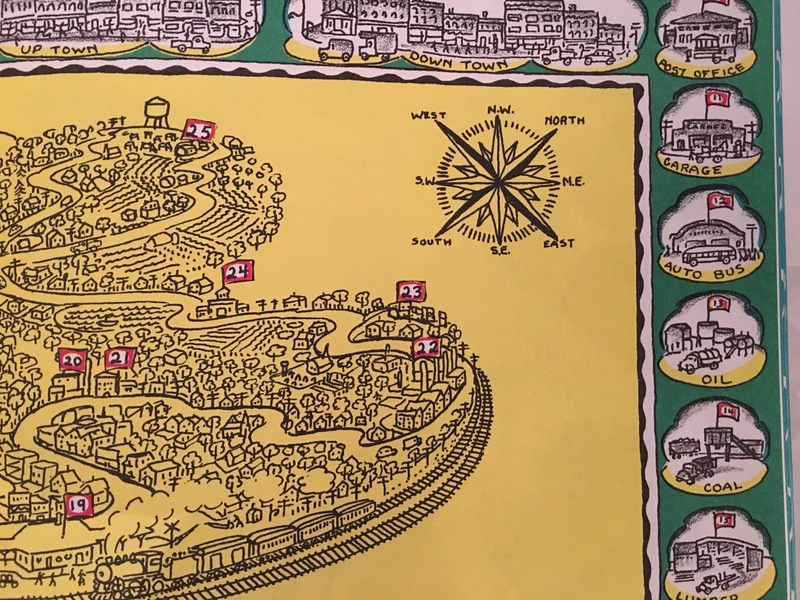 A few pages later a child said, “There’s a compass.” Sure enough, a compass is featured throughout the book. Our Big Book of the World has a compass on each page, and we often talk about north, south, east, and west. 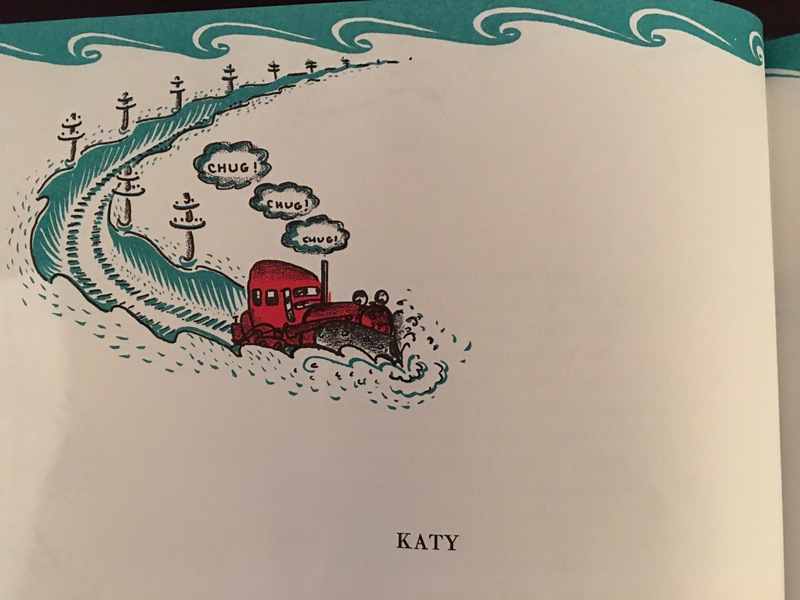 Understanding the geography of the town is key to Katy’s snow plowing in the story. And, this is just what we have been doing recently. We are learning about France this month, and over the past week we have used our atlas and our satellite map to understand France in relation to the world. We compared the two, together. The questions flowed, including north, south, east, and west. This was our compass guide for Katy and the Big Snow. 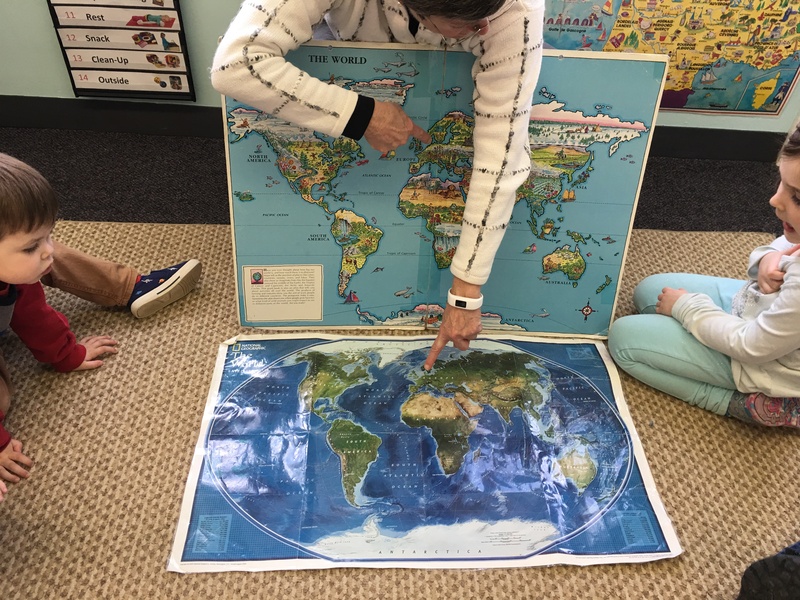 While north is not pointing to the top in the book, children needed a reference of true north. The children seemed to understand that more dots in the text meant more snow. As I read the words I held my hand above the floor to the approximate height, but that wasn’t enough. I needed to show children how much snow is two feet, etc. A yard stick to the rescue. I use this in my classroom more than I use a ruler. Young children need big! I could show them one foot, two feet, three feet. I stood up to show them five feet. They got it- a lot of snow! So, Katy plowed out the roads in each location, north, south, east and west. She helped the police, the schools, the airport, and of course the fire department. The story does not end here. Learning and enthusiasm isn’t a switch that turns on and off. It grows. Today, after two snow days, we were the first class to venture into deep, new snow. Children had to lift each foot high at every step just in order to walk through the snow. We were trail blazers. It was a thrilling adventure for children. This is emergent curriculum at its best. That means something sparks the interest of children, and a teacher builds upon it. The most important learning, things that stick and are the foundation for more learning come from the children. Math, science, geography, literacy, art… the list is a long one, and is greatly enhanced through emergent curriculum. Katy and the Big Snow is a perfect example. Oh, how I love reading-aloud and the windows that open to learning! 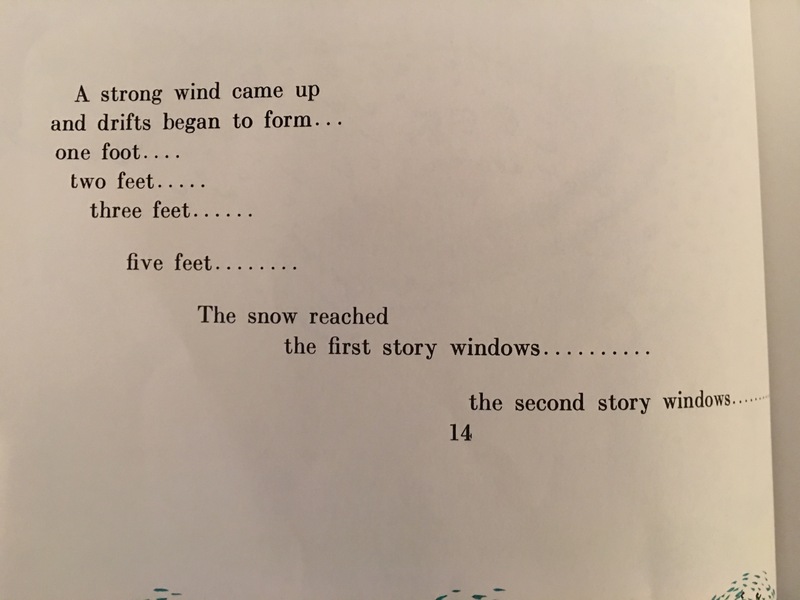 This entry was posted in Book Review, children's books, Early Education, geography, Learning About the World, picture stories, reading, Teaching young children and tagged children's books, Early Education, emergent curriculum, geography, Katy and the Big Snow, learning through children's books, reading books to children, teaching young children, Virginia Lee Burton. Bookmark the permalink. Jennie, This is simply a wonderful example of excellent teaching! Thank you, Charles. A teacher never knows when the moment presents itself for learning. But when it does, hold on to your horses, because it will be a great ride. This is a wonderful post about excellent teaching from Jennie Fitzkee. Thank you for sharing, Charles. Your posts are sublime!!! What a terrific classroom of engaged, curious human beings you lead/nurture!!! Is Ms. Burton by any chance also the author of a book about “hundreds of cats, thousands of cats, millions and billions and trillions of cats” which her name and the illustrations somehow triggered in my brain? I am going to see if I can share this post on Facebook. It is terrific and timely. Thank you for all you do in the classroom and then composing these blog posts, too! Thank you so much, Will. The author of Millions of Cats is Wanda Gag. A favorite book in my classroom. Do you know how many children learned math placement simply because of this book? I did!! This was written before Katy and the Big Snow. Do you know The Little House, and Mike Mulligan and His Steam Shovel? They were both also written by Virginia Lee Burton. Good books are almost magic, aren’t they? I’m so glad this struck a chord with you, Will. Me, too! Its great to have fun in the snow like this Jennie. On the one day it snowed here in South Africa, the kids went mad with joy. They ran around and made snowmen. it was brilliant. Even though we get a lot of snow, each one is always a wonder. I know just what you mean, Robbie. You always stir my memories-loved Brett and remember when we first read “The Mitten” . and “Katie” too. thank you! Thank you, Michele. Memories of beloved books are such a good thing. Makes me miss my kindergarten classroom, where my favorite portions of the day were read-aloud times. I remember this book! What a great teaching tool you’ve made of it. Jennie, you have me fired with enthusiasm- your teaching is infectious and I want to sit down and hear the whole book now!! What wonderful inspraitional teaching, you have such care and understanding of your students, how to bring visual aids to help them further, using nature to explain, inspire! A post full of hope, joy and learning. Fantastic! Haha! And more snow on the way Tues/Wed. ☹️ Thanks, Steve. So glad you like the book, too. As we already know, you totally ‘get it’, where kids are concerned. I didn’t know the book, but it looks really good, and I will try to get it for our grandson. Thanks, Pete. It is an oldie but goodie, written in 1943. 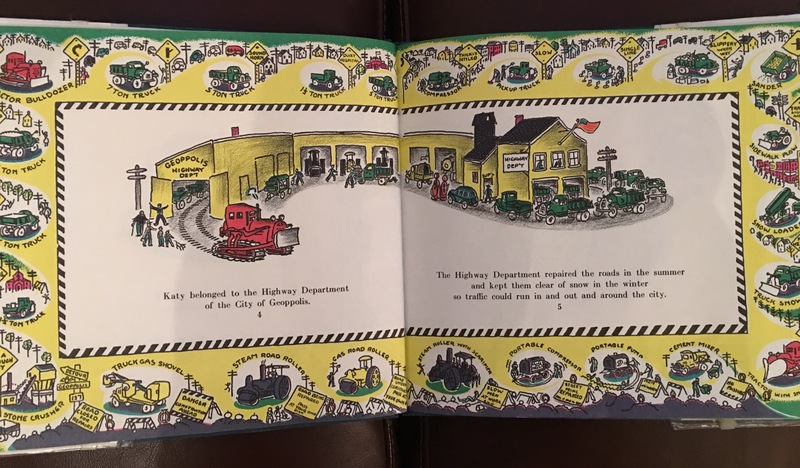 Still stands the test of time, so you will enjoy reading this with your grandson. Best to you. The cumulative nature of learning is something that is often overlooked. I’m so glad you embrace it. Well said, Dan. Thank you! I do, too! Thank you. You never miss a teachable moment! Using the weather, the compass, another writer. It is all so wonderful, I want to be a kid in your class!! Thanks so much, Darlene. Emergent curriculum at it’s best. A good book can inspire and open so many different doors. It is wonderful. Thank you, Ren! I’m so glad this jogged fun and memories. It really is a terrific book. If it’s still popular today, that speaks volumes. What a lot of great learning came out of Katy and the Big Snow. It’s wonderful how you make each book a full experience, one that will make it stand out in their memories, rather than just quickly moving on to the next story. And here we are at the end of March with more snow on the way! You are absolutely right, Marcia. Taking a book and expanding on all the wonderful opportunities it presents is the best learning and the most fun. It makes the book stick. Children will remember this book. Yes, please let us see grass without snow. Enough snow!